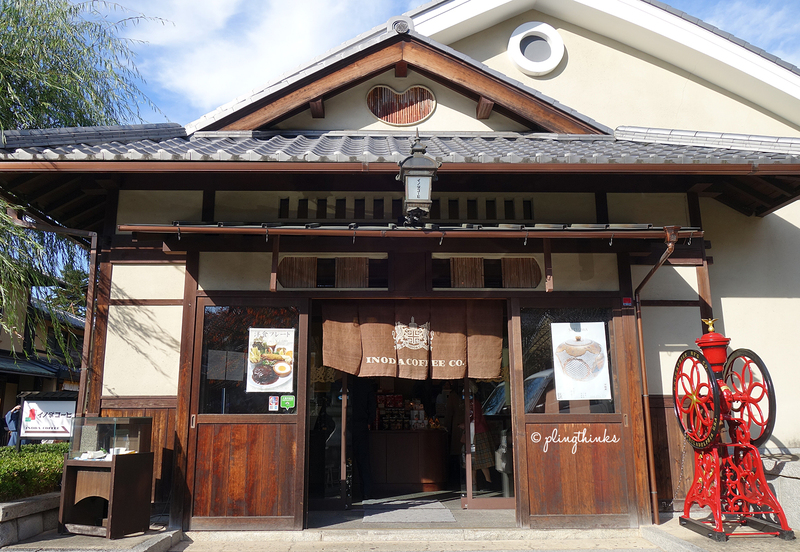 Founded since 1940, Inoda Coffee イノダコーヒ has been a beloved coffeehouse for more than 69 years, serving the residents of Kyoto with its own brand of coffee. Its first café opened in 1947 in Sanjyo 三条, and it has 7 other branches in Kyoto, 1 in Osaka, 1 in Hiroshima, 1 in Hokkaido, 1 in Tokyo, and 1 in Yokohama. It also has a take-out cake shop in Kyoto, called Ketel. Don’t expect swanky or hipster vibes in this Kyoto café. Inoda Coffee houses an old school charm that still appeals to the everyday lives of locals. There are no frills, no fuss, just a strangely familiar comfort that seems to belong to bygone days. Since 1947, Inoda Coffee has been a beloved coffeehouse for more than 69 years, serving the residents of Kyoto with its own brand of coffee. Instead of visiting the flagship café or honten 本店, we always made our way to the one in Kiyomizu as part of our exploration of the Higashiyama district 東山区 after visiting Kiyomizu-dera. You need strong knees to conquer the stone stairs winding through this historic district, but you’ll find it well worth the strain to take in the charm of the area. We often hit a sugar low during our travels, walking for miles and not wanting to waste a minute. We were thinking of making a pit stop to rest our feet when we first chanced upon this decades-old café. It was not difficult to locate the 2nd time we visited. A young willow tree poetically swayed its long tendrils of leaves at the facade of this Machiya-style café. Unlike hipster cafés, you’ll find another breed of café-goers in Inoda Coffee. We don’t see many tourists or teenagers here. Instead, we spotted many Japanese patrons, mostly in their 30s to 70s – a businessman man reading his newspapers, an elderly couple enjoying their black coffee, or Japanese ladies having a chitter-chatter over small bites. Inoda Coffee serves their own original blend coffee using cotton filters, having roasted the beans at their own coffee roasting factory. Like Japanese cafés of yonder years ago, you’ll be asked if you want your coffee with milk, sugar, or both. Do mention to the servers if you want it black. Café au lait, pictured above, has hot milk already poured in. We would recommend the Colombian Emerald (¥560) blend if you prefer something close to single origin coffee. Of light roast, this blend is surprisingly easy to drink with a rich aroma. If you prefer your coffee black and roasty like us, opt for the Arabian Pearl (¥560) blend. Of dark roast, it’s a bittersweet cup of medium acidity. Inoda Coffee has been using this blend since it was founded. As it was a pit stop for us, we had a light cheesecake (¥480) to pair with our coffees. We observed other patrons taking dainty bites from their sandwiches (¥680 – ¥1,880) and the monthly set menus (¥880 – ¥1,380). Another reason for repeated visits to this branch, which some of you might find frivolous, is that we find its single long glass window looking out to a shared garden courtyard a legit attraction point. Often, you’ll see ladies clad in kimonos passing by or taking pictures in the landscaped courtyard. Being old school and all, Inoda Coffee allows smoking inside their coffeehouses. You’ll be asked if you’d like to sit in the smoking or non-smoking areas. It can get quite reeky if you happen to sit beside a table of 4 all puffing away at the same time. Other times, we weren’t affected as we sat quite a distance from the smoking area. Alternatively, if the weather is cool and beautiful, take a seat outside. You can admire the Japanese garden and people-watch while sipping your cuppa. Having boosted our meagre strength with some caffeine and sugar, we took a walk in the Japanese garden, shared with its neighbour, Yōjiya. We even ran into a couple of elderly photo enthusiasts snapping away with their humongous DSLRs. pling thinks…if you’re in for a local experience, weave in a visit to Inoda Coffee for a chance to see how first-wave coffee roasters and old school Japanese cafés are like. From Kyoto Station, take bus 100 or 206. Alight at Kiyomizumichi stop 清水道. Cross the road and start the trek uphill on Matsubara-dori 松原通. From Kiyomizu-dera’s entrance gate, walk down along Matsubara-dori 松原通. Keep a lookout on the right for stone steps going downwards (pictured above). You’ll see 七味家本舗, a shop selling Japanese condiments. Walk down the flight of stone steps towards Inoda Coffee. Find the young willow tree and viola~!